A tale of love, manners, and the quest for perfect vowels. 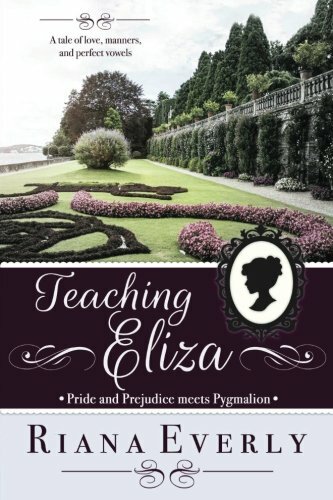 Professor Fitzwilliam Darcy, expert in phonetics and linguistics, wishes for nothing more than to spend some time in peace at his friend’s country estate, far from the parade of young ladies wishing for his hand, and further still from his aunt’s schemes to have him marry his cousin. How annoying it is when a young lady from the neighbourhood, with her atrocious Hertfordshire accent and country manners, comes seeking his help to learn how to behave and speak as do the finest ladies of high society. Elizabeth Bennet has disliked the professor since overhearing his flippant comments about her provincial accent, but recognizes in him her one opportunity to survive a prospective season in London. Despite her ill feelings for the man, she asks him to take her on as a student, but is unprepared for the price he demands in exchange. Teaching Eliza is a full-length novel of about 110 000 words.